This afternoon, BALMORAL left her temporary Glasgow home and commenced her journey back to the Bristol Channel. For the passage, her forward saloon windows have steel shutters in place to prevent any damage should she run into heavy weather. Although it appeared that she was bound for Campbeltown, she in fact anchored off Lamlash for the night. BALMORAL is currently wearing the colours of her owners from 1969 until 1981, those of P&A Campbell which was the main operator of 'steamer' services on the Bristol Channel. In the background of this picture is the church at Kilmun, on the shores of the Holy Loch, which has connections with the Campbell family. In the latter half of the 19th Century, Captain Robert Campbell operated steamer services from Glasow to many parts of the Clyde, and in particular to the Holy Loch. He also made Kilmun his family home, and his sons Peter and Alexander later followed in his footsteps as owners of Clyde steamers. 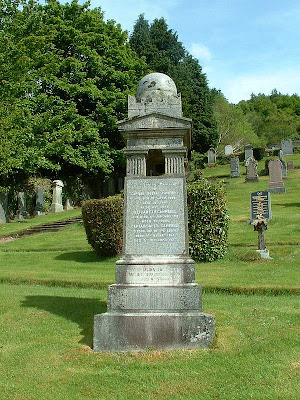 When Captain Robert Campbell died in 1888, he was buried in Kilmun churchyard. The two sons later moved south, to Bristol, and soon became well-established there. 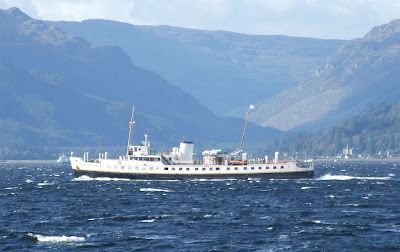 In 1914, Alex Campbell, by then Managing Director of P&A Campbell, moved back to Kilmun, although during the early summers he would return to Bristol while the excursion season got under way. 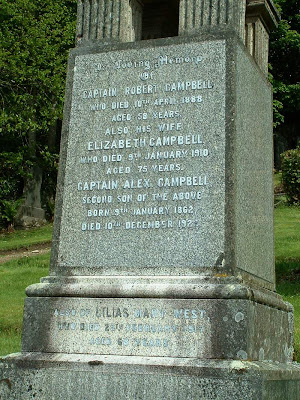 Captain Alexander Campbell passed away in December 1928, and was also buried in the churchyard at Kilmun. This is a wee bit different.